Have your Bank Passbook on your mobile that works completely off-line. With auto sync facilities on MiPassbook, you can have all your relationships viewed on your smartphone irrespective of Brand, Size and Operating Systems. MiPassbook supports Smart Phones, Tablets, iPad, iPhone etc. starting with Android 4.x and IOS 7.x. MiPassbook is highly secured and your data is completely encrypted and stored on your phone. Digital Signature of the bank authority makes MiPassbook authentic. MiPassbook completely breaks the existing digital restriction of displaying data for a specified period. You can have the transaction data from the date of your account opening on your own device. When you change your phone and logon to a new device, your old data will be automatically destroyed for security purposes. Progressive Sync facility of MiPassbook displays data immediately on sign-on to the device with background data sync. MiPassbook display your Relationship / Account data along with number of relationships you have with the Bank. Against each Account, on clicking you can view the complete transactions. MiPassbook supports the Savings Account, Current Account, Credit Cards, Fixed Deposits, Recurring Deposits, Investment Products like Mutual Funds / Equities, Bank Assurance Products like General Insurance / Life Insurance, Loan Products like Home Loan / Vehicle Loan etc. conveniently on your Smartphone. You can download your statements in PDF format along with a digital signature for any KYC submission. Push Notification facility of MiPassbook gives the opportunity of publishing any new products introduced by the Bank to end customers. 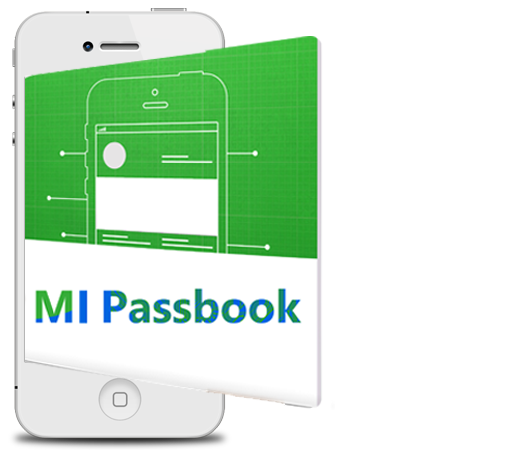 MiPassbook can also assist in KYC Updation and collect any other customer data in real time. Bank can publish its offers to the customer based on business logic and instant push notification. MiPassbook is available in 162+ Languages so that your customers can conveniently view the Passbook in their local language conveniently. Looking for Customer Data Management App?